Underwear is probably one of the most underrated pieces of hiking apparel. Hikers and mountaineers usually spend a lot of money on other clothing but become penny-pinching when it comes to underwear. However, we don’t think that underwear is something where you should try to save money as it is in direct contact with your skin and therefore very important for comfort and performance. This is especially true for long hiking trips where anti-microbial underwear will help you to pack lighter and smell better. In this review you will find a selection of the best hiking underwear. We have chosen the best five hiking boxers currently available and reviewed them to make your buying decision easier. This selection includes primarily men's products. For women's products check out the Best Hiking Underwear for Women. 1. Buying Hiking Underwear – What is important? Hiking underwear should be made of a comfortable material which doesn’t cause rubbing or chafing. Furthermore, it should be also breathable, moisture-wicking and quick-drying so that it efficiently maintains your body’s natural temperature. To achieve these qualities hiking underwear is normally made of natural materials such as Merino wool or synthetic materials such as polyester or nylon. Elastane might be added to these fabrics for better stretch and comfort while a small percentage of nylon fibers is often added to Merino wool fabrics for better durability. Many hikers face a dilemma whether to buy Merino wool underwear or underwear made of synthetic materials. Merino wool underwear has several advantages in comparison to synthetic underwear – it is naturally antimicrobial, pleasant to the touch (not itchy like ordinary wool), provides warmth even when wet (soaked with sweat or rain) and offers better breathability. Also note that Merino wool underwear is not only suitable for cold weather as Merino wool can be knitted into very thin fabrics which are suitable for warm summer days. However, synthetic underwear is less expensive and more durable than Merino wool underwear. Furthermore, it also dries slightly faster. For more information about underwear materials read our article Comparison of Base Layer Materials. Hiking underwear should have flatlock seams because they offer great comfort, unlike normal seams which can chafe your skin by rubbing against it repeatedly. Learn more about flatlock seams in our article What are flatlock seams. It’s a great advantage if hiking underwear is antimicrobial. This means your underwear will remain fresh after days of use. Some materials, like Merino wool, have natural antimicrobial properties. Other materials, like polyester and nylon, are usually treated with antimicrobial agents such as Polygiene to provide antimicrobial properties. Antimicrobial treatments will, however, get washed out eventually. Hiking underwear should be machine washable and maintain its properties after regular washing. 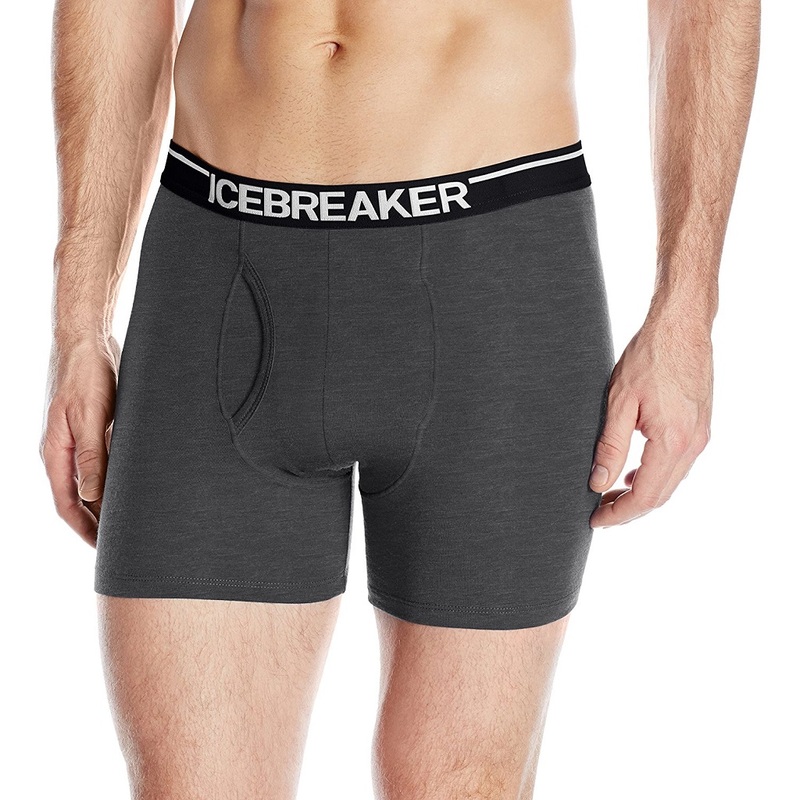 The Icebreaker Anatomica Boxers provide great comfort. They are made of a corespun fabric with Merino wool (83%), nylon (12%) and Lycra fibers (5%). The fabric has the best qualities of Merino wool (it’s breathable, moisture-wicking and soft to the touch) while the durability and stretch are significantly better than that of Merino wool – nylon fibers provide the durability and Lycra fibers provide the stretch. The density of the fabric is 150 g/m2 which is perfect for aerobic activities such as hiking and mountaineering. The Icebreaker Anatomica Boxers are also equipped with a fly, flatlock seams and a branded elastic waistband. 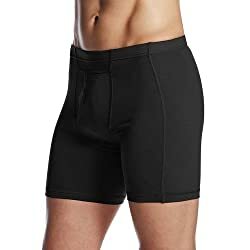 They are definitely a good choice for every hiker who wants a pair of durable, comfortable and odor-resistant boxer briefs. Women's Version: Not available - see the Women's Hiking Underwear instead. 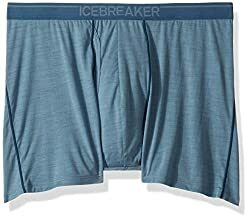 The SmartWool 150 Boxers are made of a similar fabric (87% Merino wool, 13% Nylon) as the Icebreaker Anatomica Boxers above. However, the Smartwool 150 boxers don’t contain Lycra fibers and are thus not as stretchy. Nevertheless, they offer great durability and efficiently wick moisture away from the skin. Furthermore, due to the nylon fibers, they also dry fast. In terms of construction, the Smartwool boxers are equipped with a stylish elastic waistband and stitched with flatlock seams which prevent chafing. 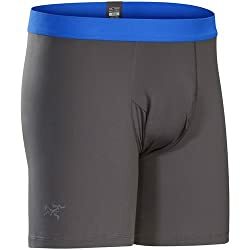 These comfortable, naturally antimicrobial and durable boxers are highly recommended for hikers and mountaineers who need high-quality underwear for their demanding adventures. 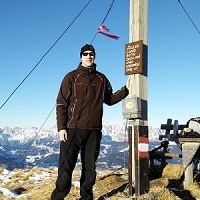 The Minus 33 Acadian Boxers are very popular among hikers and mountaineers as they offer great comfort and performance. They are made of a quite thin (170 g/m2) 100% Merino wool fabric and are thus perfect for all-year-round use. The Merino fibers used are just 17.5 microns in diameter which grades the wool as Ultrafine – meaning that it is very soft and comfortable to the touch. Due to the fabric, these boxer briefs are breathable, moisture-wicking, comfortable and odor-resistant. For good comfort, the boxer briefs are equipped with a fly and flatlock seams. The Minus 33 Acadian boxers are a great choice for anyone who wants great performing underwear for his physically demanding adventures. The ExOfficio Give-N-Go Mesh Sport Boxers are made of an ultra-light mesh fabric and thus they provide an ergonomic fit that satisfies even the most demanding hikers and mountaineers. The mesh fabric also makes them light, stretchy and soft. The boxers are made of nylon and Lycra (for stretch) fibers which are treated with Aegis Microbe Shield – a technology that efficiently eliminates odor-causing bacteria. The Aegis Microbe Shield is unique because unlike other odor-control materials it provides long-term control of bacteria growth on treated surfaces. A silver-ion treatment for example, is eventually washed away but the Aegis Microbe Shield is molecularly bonded to the treated surface. The ExOfficio Give-N-Go Mesh Sport boxers are also quick-drying and fairly breathable. We recommend them to those who want superb underwear for hiking in summer – while Merino wool underwear is to be preferred in other (colder) seasons as it maintains its warmth even when soaked with sweat. The Arcteryx Phase SL Boxers are made of the advanced silk-weight Phasic material (100% polyester) which pulls the moisture away from the skin and disperse it across the entire surface for faster drying. Because the material is super thin, the boxers also provide great breathability and freedom of movement. Additionally, the boxers feature a stylish elastic waist band and flatlock seams for good comfort. The Arcteryx Phase SL Boxers are a great option for hiking in warm weather and highly aerobic activities such as running and mountaineering. However, as they are not antimicrobial, we don’t recommend them for multi-day hiking trips. Antimicrobial underwear doesn’t get smelly even if you wear it for days without washing. Antimicrobial underwear is typically made either of Merino wool or synthetic materials such as polyester and nylon. Merino wool is naturally antimicrobial while synthetic materials must be treated to become antimicrobial. These treatments will eventually be washed out and the antimicrobial properties decrease accordingly. What is moisture wicking underwear? Moisture wicking underwear pulls the moisture from your skin and transfers it to the outer layer where it evaporates or gets absorbed by your pants. Merino wool is known to be very moisture-wicking. However, other materials such as polyester and nylon are also moisture-wicking. What is the best underwear to workout in? For working out we recommend wearing underwear made either of Merino wool or synthetic materials like nylon and polyester. These materials are quick-drying and moisture-wicking. Therefore, they prevent discomfort and chafing.